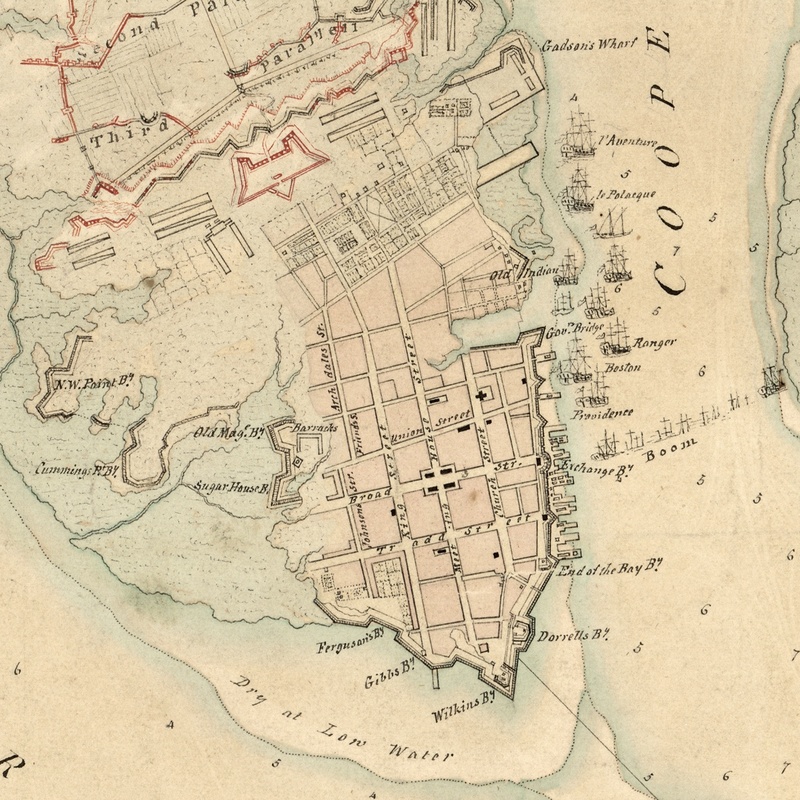 This map of Charleston, surveyed in 1788 and published in 1790, was made shortly after the demilitarization of the city. 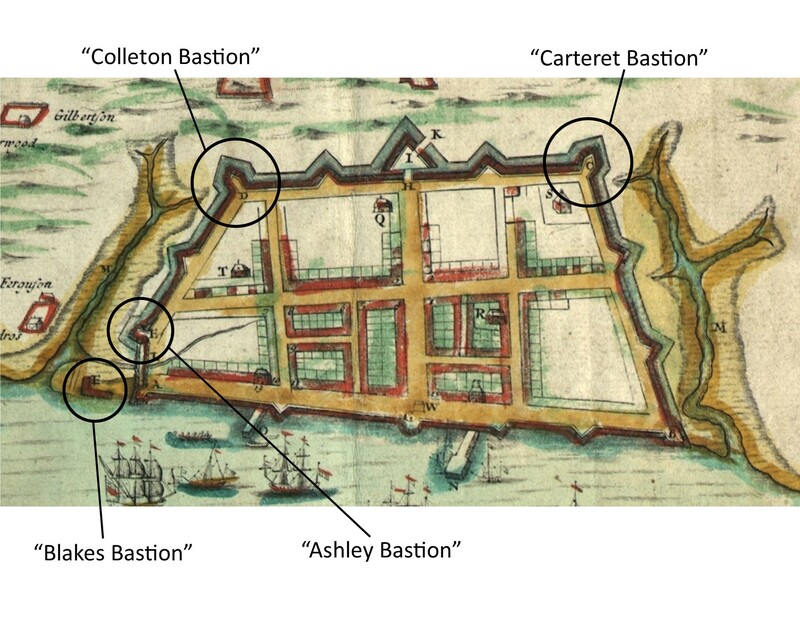 Craven Bastion, located at the foot of the creek that would soon become Market Street, is the sole remaining fortification depicted on this map. 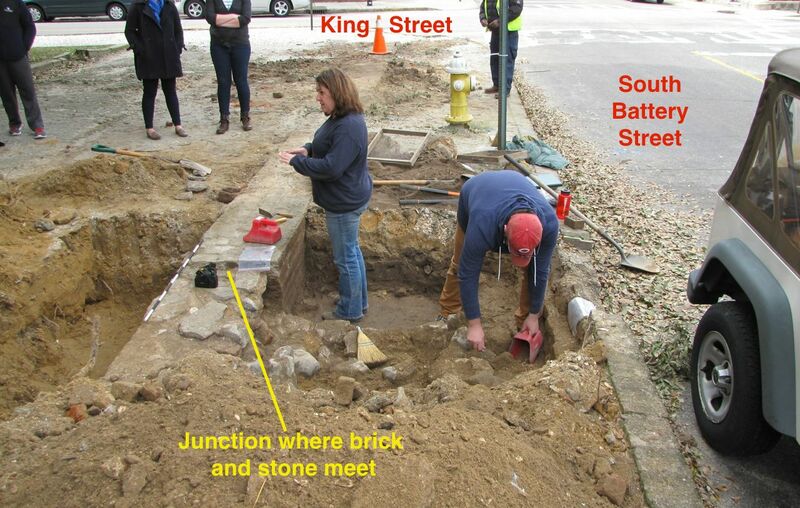 Today’s archaeology at the southeast corner of King and South Battery Streets focused on one specific feature that is visible at the surface of the ground: the point at which the composition of the sea wall under investigation transitions from brick to stone. 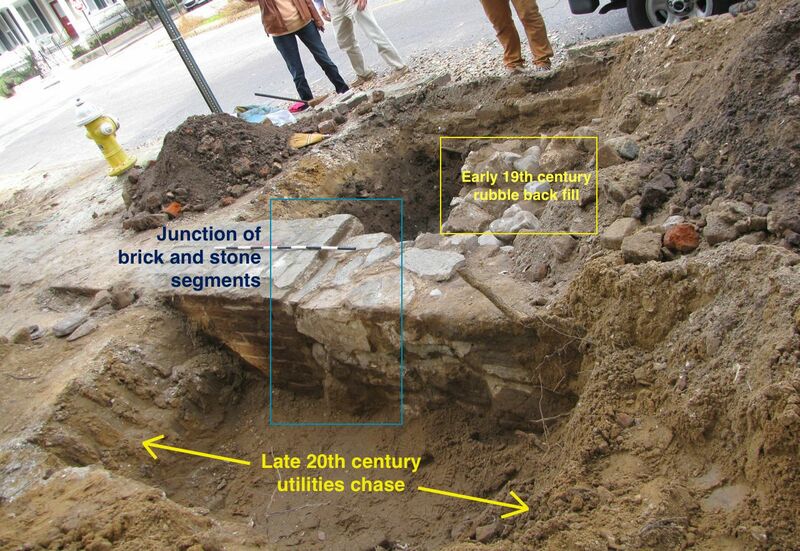 We dug on both sides of the wall in search of clues that might help us determine the vintage of the materials and the sequence of construction. Based on what we’ve seen over these two days, it appears that most of our target, the 1769 sea wall, was rebuilt during multiple repair episodes in the first half of the 19th century, and the original construction materials (brick and Bermuda stone) were deconstructed and recycled as fill behind the rebuilt wall. In response to Robert Behre’s article in today’s edition of the Post and Courier, a number of local residents and tourists stopped by the dig site to peer into the past and ask questions. As always, it was a pleasure to share our discoveries, theories, and enthusiasm for urban archaeology. The point at which the brick wall transitions into a stone wall. 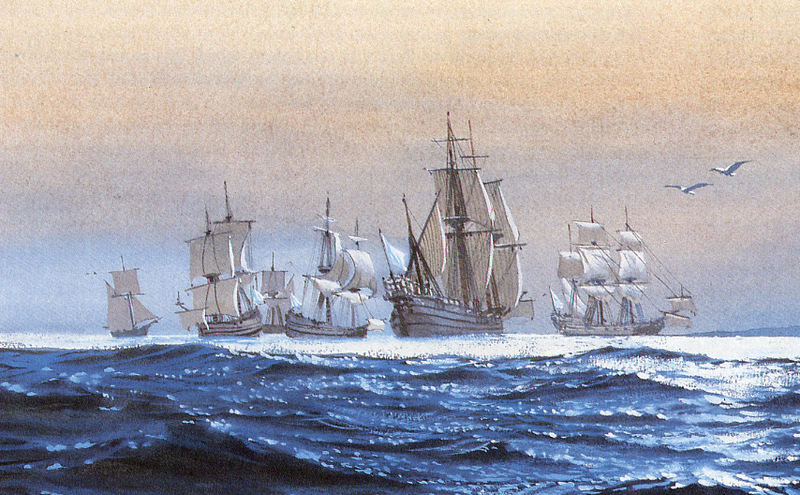 We commenced digging approximately 40 feet east of King Street, on the south side (water side) of the sea wall. As we learned yesterday, there is a large concrete utility chase in this area running parallel to our wall, so we knew we would only be able to excavate to a depth of two or three feet. Approximately two feet below the surface, we encountered the concrete chase and began to clean the wall for a better view. As you can see in the photo, some masons in the past took a certain amount of care to fit and mortar irregularly shaped stones into the jagged edge of the brick work. Both of these elements, however, appear to represent nineteenth century repairs. 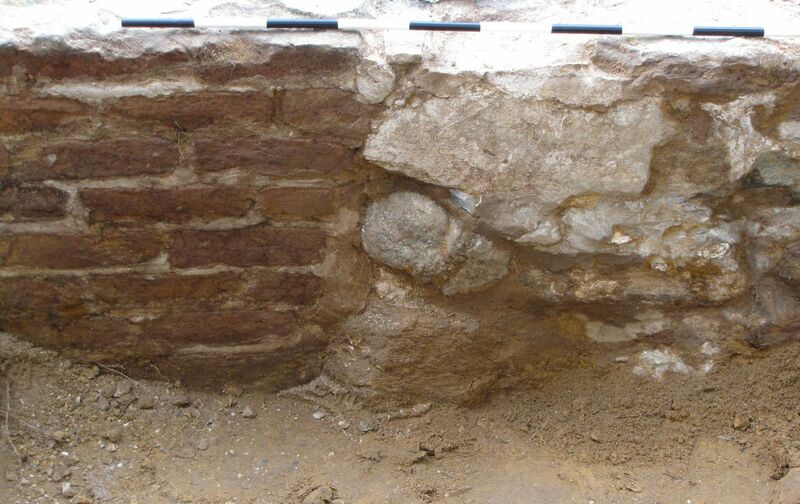 The appearance and size of the bricks, combined with the color and composition of the mortar, suggest that these materials replaced the eighteenth-century bricks and mortar that originally composed the wall. As mentioned in yesterday’s posting, we also know that repairs to this wall were done with stone after 1811. But which came first—the brick repairs seen here, or the stone repairs? That’s a question that will require further digging through the surviving newspapers and other documentary records. A view of the south side of the wall at the brick-stone interface. A view of the north side of the wall adjacent to the brick-stone interface. Unable to dig deeper on the south side of the wall, we turned our attention to its north side to see if there might be other clues to help decipher the brick-stone intersection. Behind (north 0f) the wall we found the same mix of fill materials as yesterday; that is, ballast stone, eighteenth-century brick bats, and a large quantity of fragmented Bermuda stone. We remain in awe of the prevalence of Bermuda stone concentrated in this small area. Whether or not the wall we’re investigating represents work completed in 1769 or extensive repairs in the 1830s, the profusion of otherwise-rare Bermuda stone at this location confirms that we’re in the right place and, at the very least, seeing the city’s attempts to maintain a very useful piece of colonial waterfront infrastructure. Like yesterday’s work, today’s study of the back fill area yielded a number of ceramic fragments that continue to indicate that this site was heavily disturbed during the first half of the nineteenth century. Looking east at the back fill behind the sea wall (at right), showing the loose and consolidated sections of rubble materials. In today’s case, however, we observed a difference in the nature of the fill behind the wall. Careful hand-troweling through the rubble revealed that a reasonably discrete portion of the fill was slathered in mortar, as if in an attempt to create a unified body. 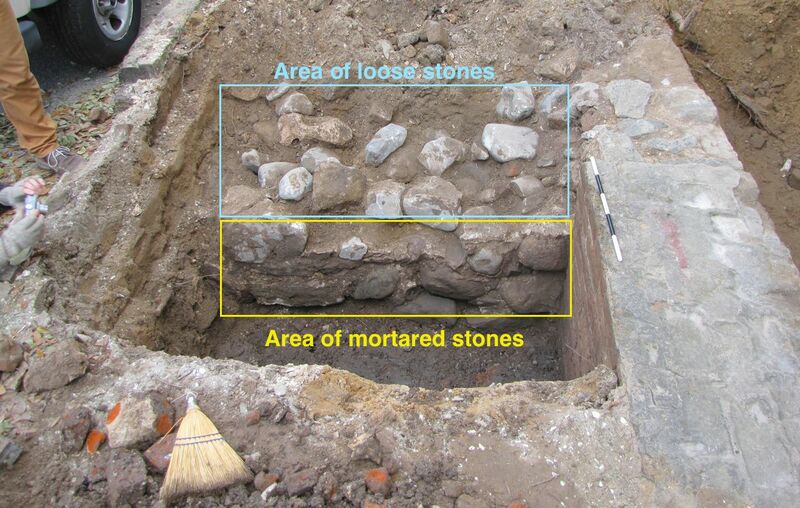 The extent and purpose of this mortar-bound fill is unclear, but we have a theory. 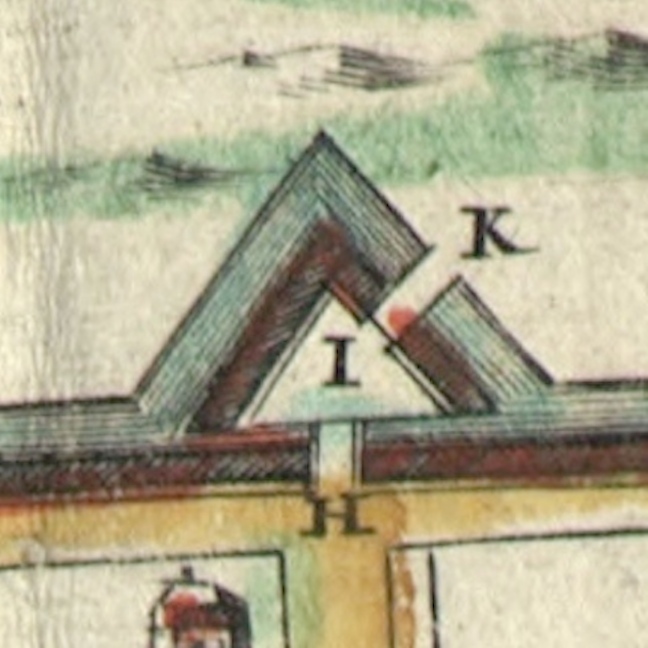 The consolidated section in question is perpendicular to the wall, and perhaps was intended to act as a buttress or “counterfort” to stabilize the wall against the opposing force of the tides. Speaking of the tides, today’s downward digging once again found water just a few feet below the surface, and it’s hard to forget that the Ashley River is just a stone’s throw away from our site. And so, hemmed in by modern utilities, streetscapes, and seeping tidal waters, we closed up our units and now begin the work of analyzing the data. 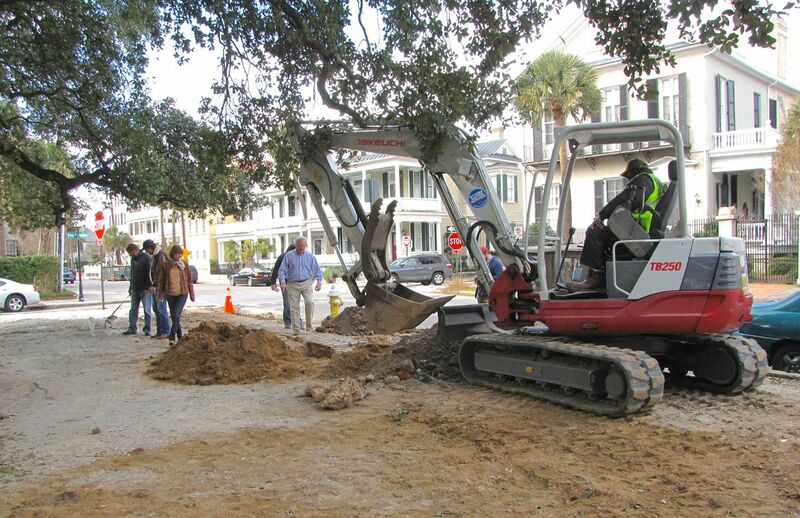 The Mayor’s Walled City Task Force extends its collective thanks to the City of Charleston (especially the Stormwater Services and Parks Departments), Clemson University, the Charleston Museum, the College of Charleston, the Charleston County Public Library, the Post and Courier, and every one who visited the site, for helping to make this brief but very productive collaborative venture a success. 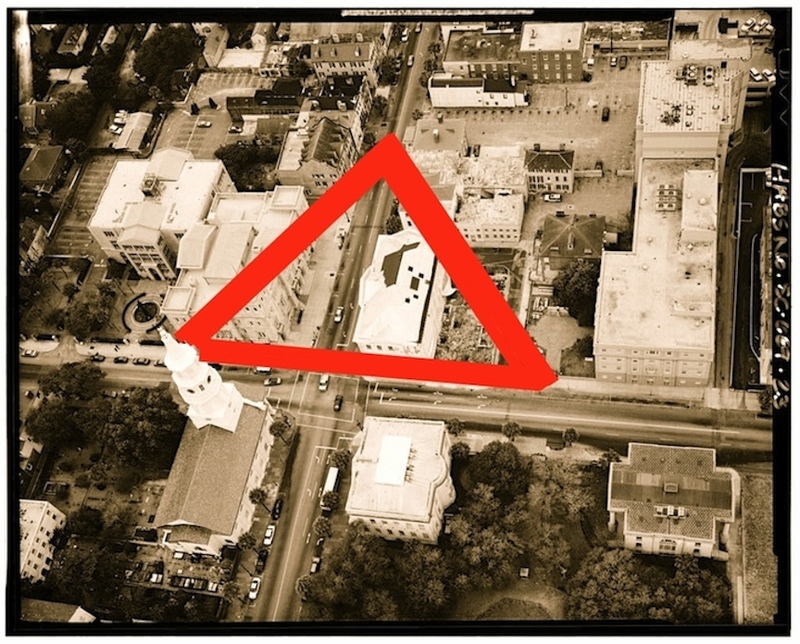 Our goal is to pursue and to share knowledge in an effort to increase public understanding and appreciation of Charleston’s history, and I think we’re right on target.